Ok, so I haven’t gotten a CSA box yet (Friday, Friday, can’t wait for Friday! ), but I did accompany Mom to Haymaker Farm Market yesterday to get her box, and I picked up some great stuff there. For dinner tonight, I grilled chicken from Duma’s that I marinated in olive oil, balsalmic vinegar, lemon and lemon zest, sage and garlic scapes. 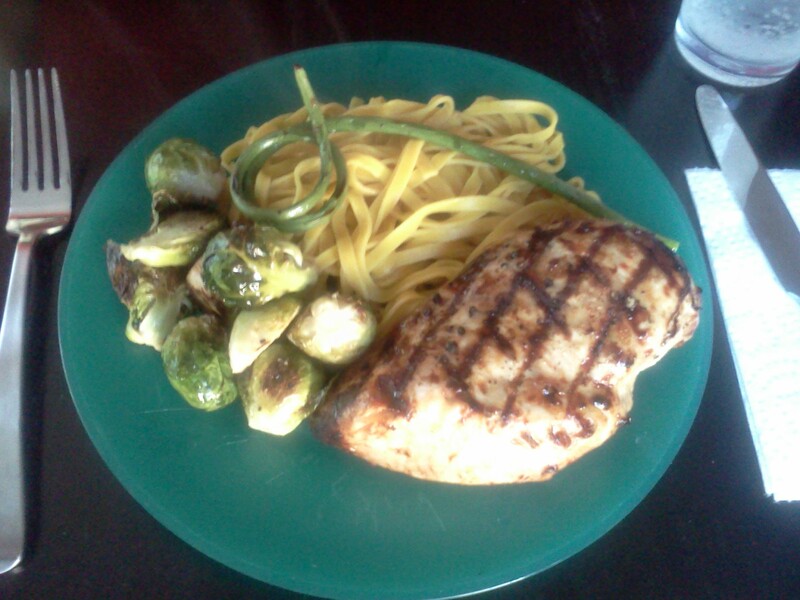 I roasted brussel sprouts from Krieger’s (Brian will break down walls for brussel sprouts, and these were really good) and made saffron pasta from Ohio City Pasta. We had the roasted red pepper pasta last night, and they were both great. I also grilled some garlic scapes from the farmer’s market – just tossed with olive oil, salt and pepper and grilled for about 3 minutes. The garlic scapes were surprisingly tasty – and pretty! This entry was posted in General on June 10, 2012 by Melissa. I’m hungry just looking at it. Nice touch with the scape. I love brussel sprouts now too! I never really liked them until I learned about roasting them. So fun to see you at the market, Melissa! Very nice presentation! How did you like the saffron pasta? ( I know you were wondering if Brian would like that. ) I am also a huge fan of the roasted brussel sprouts. Looks great! The saffron pasta was very good, but I think I preferred the roasted red pepper. The house still smells like roasted brussel sprouts! I love the comment about how quick it goes when eating excellent food. It looks like a great meal!